Got into my classroom today and am making some progress on decorating. Wanted to share what I’ve got so far; perhaps an idea might inspire you. 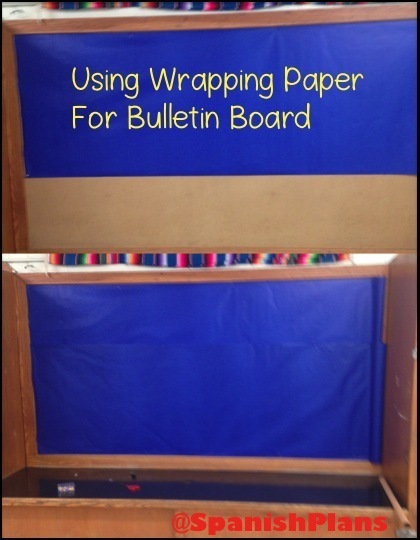 I love using plastic tableclothes for bulletin boards. They are so easy to put up. They cling to the background, I use a pushpin to hold them into place as I cut it perfectly at the edge. And it’s cheap: I pick these up at the dollar store. They will last for several years. I also used wrapping paper for this other bulletin board. I would suggest a high quality paper instead of the dollar store brand because those rip rather easily. Check out the party store for fun designs. I had this old shelving unit in my classroom with warped shelves. I never used it. 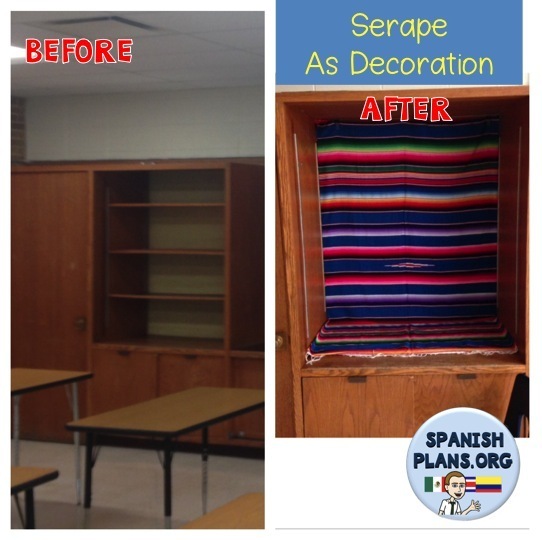 I used to have this serape hanging above the second bulletin board, but after I noticed the shelves had a different paint color than the rest of the room, I decided to take the shelves out and hang up the serape in a more prominent place. I also updated my subject pronoun chart with my new subject pronoun strips. You can can get them as part of my Subject Pronoun Unit or separately. Our subject pronoun posters are also part of the Unit, or can be purchased separately and look great displayed on a door. 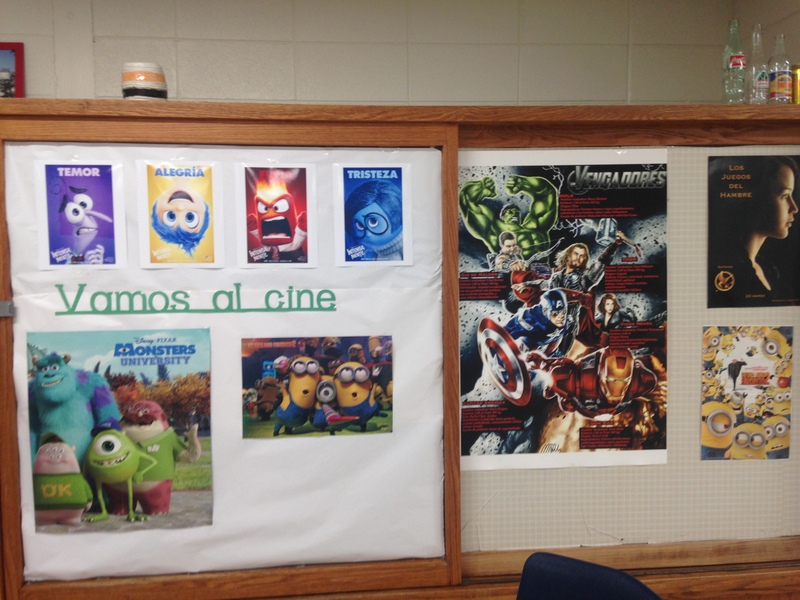 Next, I printed off some movie posters from “Intensamente (Inside Out) to make this “Vamos al cine” bulletin board to accompany my Vengadores poster, Juegos del Hambre poster, and Mi Villano Favorito poster. Need to add some die-cut palomitas y dulces and more movie posters throughout the year. The last thing I got accomplished today goes along with my Travel Theme for the year. Students will be receiving a boarding pass on day 1 and we will be making passport this year. 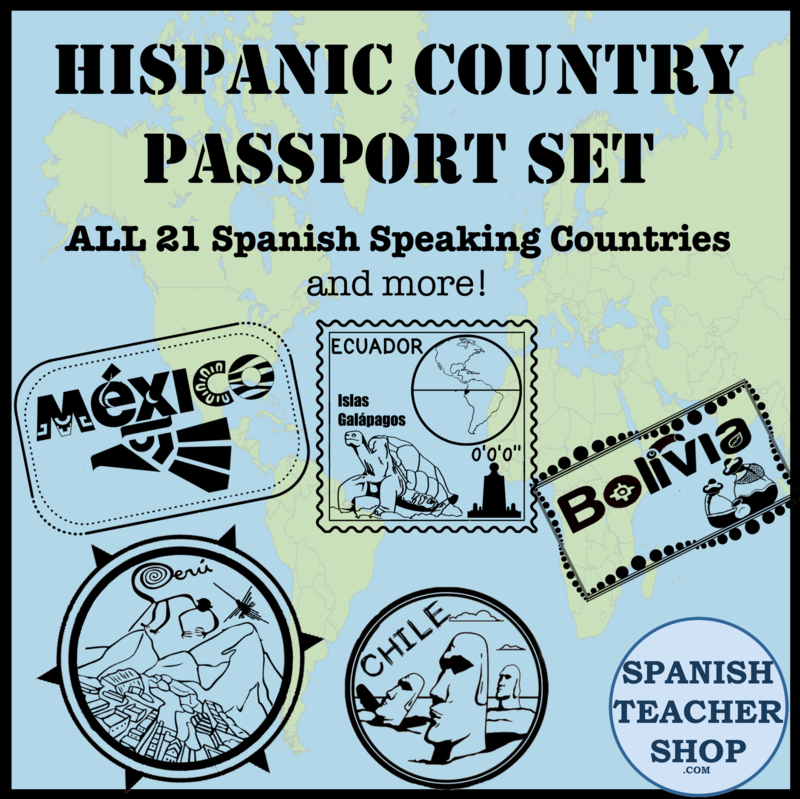 This bulletin will hopefully spark their interest of some of the sights that can be seen in Latin America. Still need to finish our Mexico Bulletin Board. But still one week before students come! Got the colors up, just need to add the realia! 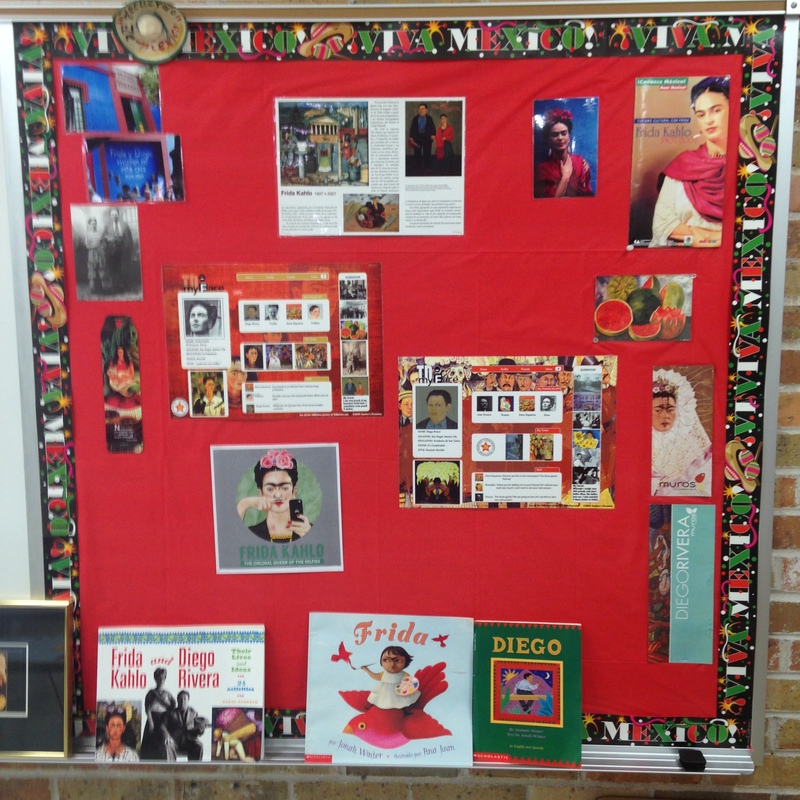 Edit: Here’s the Diego and Frida side of the Mexico bulletin board. If you liked any of these idea, please share them on pinterest. 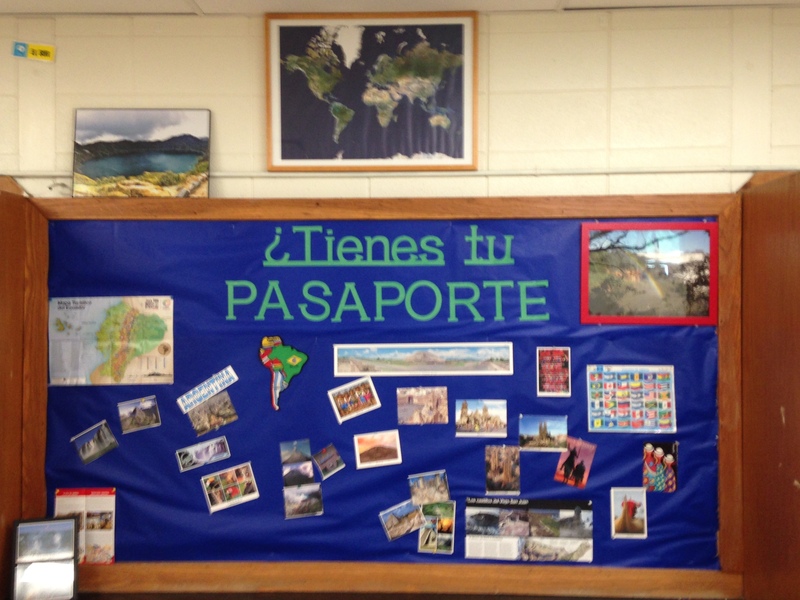 This entry was posted in Bulletin Boards and tagged bulletin boards, classroom decoration, decoration, travel. Bookmark the permalink. Wow your room looks fantastic! Could you please share how you plan to use the Inside Out movie them as part of your curriculum or unit? Love your room and love the ideas thank you! This makes boards look easy. Thanks!